I’ve discovered this week that there’s quite a lot of you following my blog, so the pressure was on for me to bravely remove the dust sheet from over the computer and hoover off the fine layer of dust that had infiltrated the defences. If this computer survives, I will be stunned! 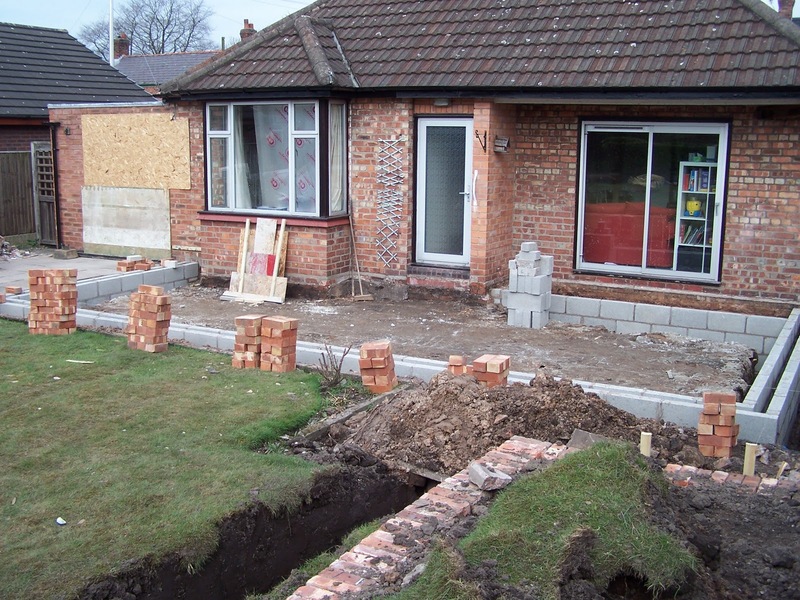 We now have foundations (yeah!) and 4 courses of bricks (yeah! ), a soakaway trench filled with our rubble (yeah!) and a new door through to the garage from the soon-to-be-kitchen (yeah!). We had two builders on site this week – Mike and Mike! Funny if you’re me, even funnier if you’re 3 ½!! Big Mike has a 4 yr old so was totally non-plussed to be entertaining two young boys. It is easily the best childcare I’ve had in a long time – two builders, a digger, a truck, tea making duties – not to mention the Desperate Housewives too. I’ve had friends round for a cuppa asking for a call back when it’s Diet Coke Break time. We’ve had a few problems with our Building Control Officer (also called Mike) who has not been answering his phone or responding to emails – not so good when he’s needed to check progress on site. We’ve also discovered that Planning are treating our application for a Lawful Development Certificate like a full-blown planning application which is very irritating and time-consuming. The views and anecdotes herein are entirely the opinion of weeboysmum and are not necessarily how others involved in the project would recount them.